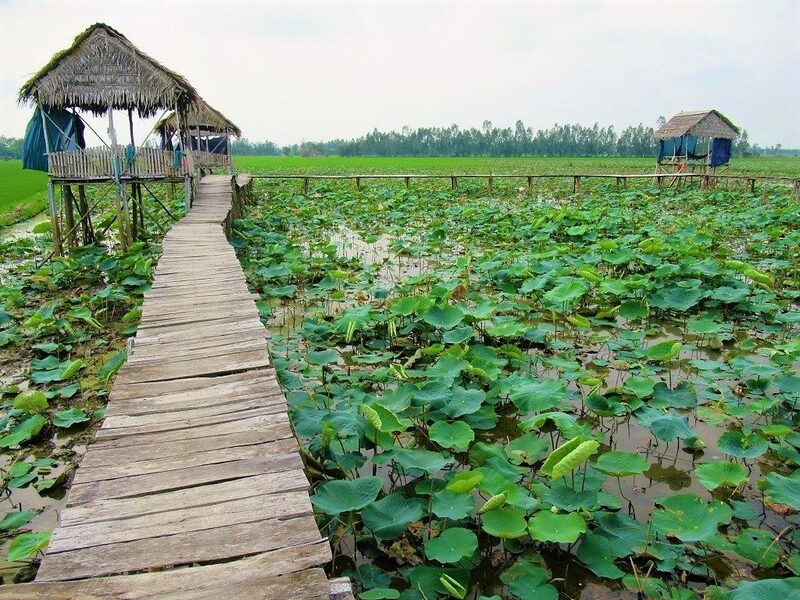 Dong Thap Province, roughly 120km west of Saigon, is usually overlooked by travellers, who tend to focus on more famous Mekong Delta sights and towns, such as the floating market of Cai Be, and the commercial hub of Can Tho. This has left Dong Thap, a green and, by Mekong Delta standards, quiet and sparsely populated province, relatively unvisited. About halfway along Provincial Road DT845, there’s a turn off for Gò Tháp, down a peaceful, green lane. 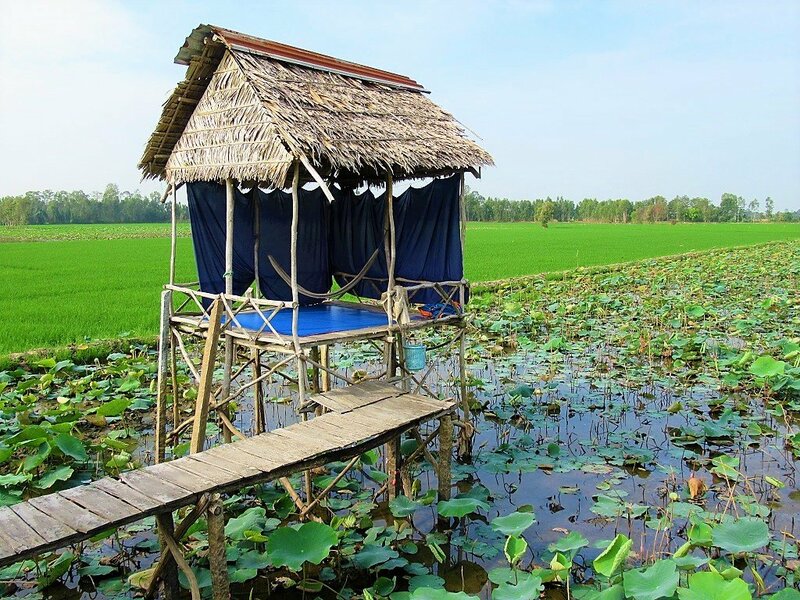 After crossing a small bridge, a smaller lane turns back on itself, leading through a shady grove of trees and along the edge of a large expanse of flooded fields, full of rice seedlings and lotus flowers. 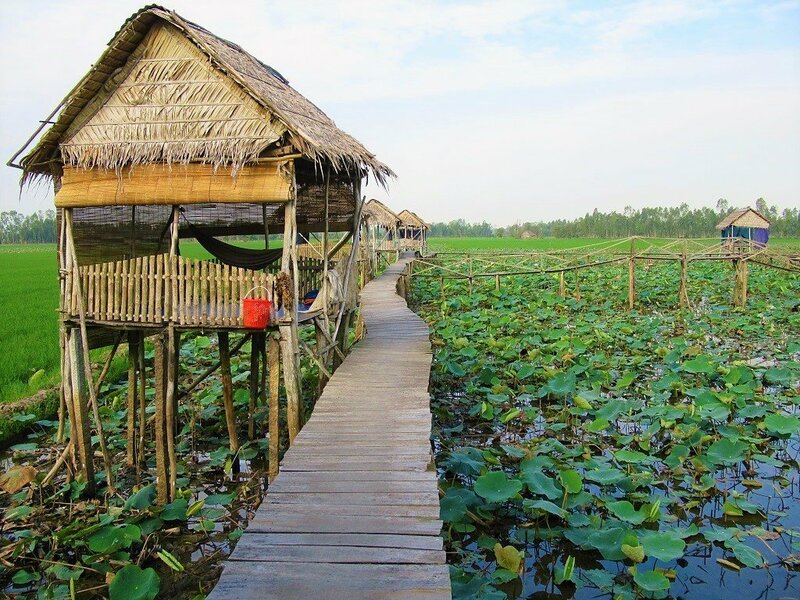 On the edge of this flooded farmland, there are about half a dozen homestays consisting of clusters of wooden huts constructed on raised plank-walkways above the lotus lake. It’s difficult to know which of the homestays to choose. Personally, I like Hai Lúa, one of the first in the row. But 9 Theo and Hương Sen, further along the lane, are also very good. During the week, it’s quite likely that you’ll have the whole place to yourself, at least in the evenings. The owners tend to go to bed early (around 8pm), after which the lights go out, and you’re left to enjoy the peace and romance of a night suspended above sleeping lotus flowers and croaking frogs. But on weekends and public holidays it’s a very different experience: Vietnamese groups from around the region come to eat, drink and be merry, which involves a lot of great food, loads of rice wine, and lots of noise from the karaoke systems. Of course, this is not the peaceful, rural Mekong Delta experience that you might want/expect, but it can also be a lot of fun. Therefore, before planning a trip to the lotus lake homestays, bear in mind the differences of visiting during the week vs the weekend. Also note that during the week there’s no need to book in advance, but on the weekend there could be limited availability. As there’s no public transportation, the homestays are best reached by motorbike, bicycle or hired vehicle. If you really want to, you could reach the homestays by a series of connecting public buses from Saigon, but for the purposes of this guide, I am assuming most people will come on their own wheels. Motorbike parking is by the side of the road, opposite the homestays. The owner or staff member will come out to meet you and then punt you across the muddy canal, separating the road from the homestays, on a wooden raft. This alone is a lot of fun, and it sure beats the marbled lobbies of five-star hotels for a theatrical entrance. 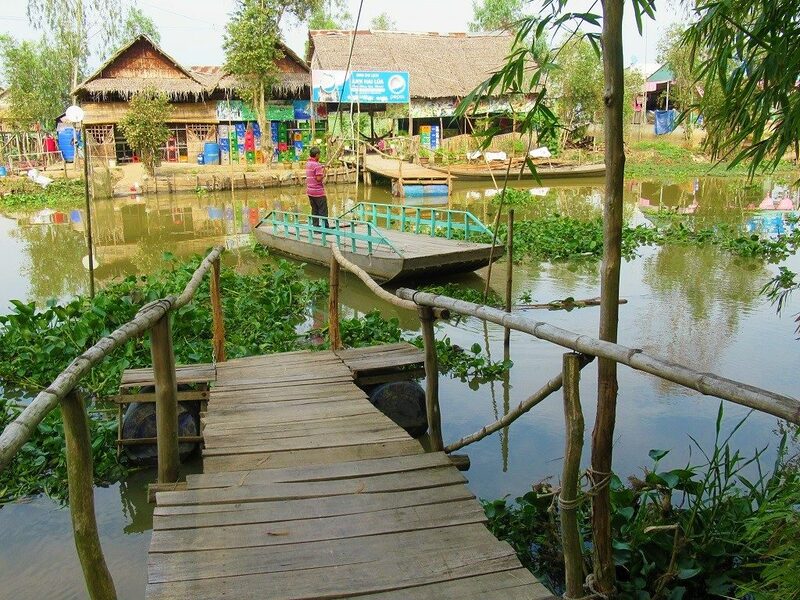 (During the night, your motorbike is also punted across the water to be kept safe in the homestay). Your hosts will sit down to discuss prices, sleeping arrangements, and food and drink. In most cases, not much English is spoken, but as people in the Delta tend to be gregarious and outgoing, there’s rarely any problem with communication. Sleeping is between 100,000-150,000vnd ($5-$7) per person. There’s usually a choice of a hammock or a mattress on the floor, both under the thatched roof of one of the wooden huts. (It’s worth noting that, as romantic as a night in a hammock sounds, it’s not that comfortable after a few hours, so if you intend to get some sleep, it’s probably better to opt for the mattress.) The huts have mosquito nets, power sockets, WiFi, and small trash cans. Dinner is also negotiated on arrival, so that the family can prepare the ingredients for your meal. Most homestays have a full menu with prices. In general, each dish is between 50,000-150,000vnd. 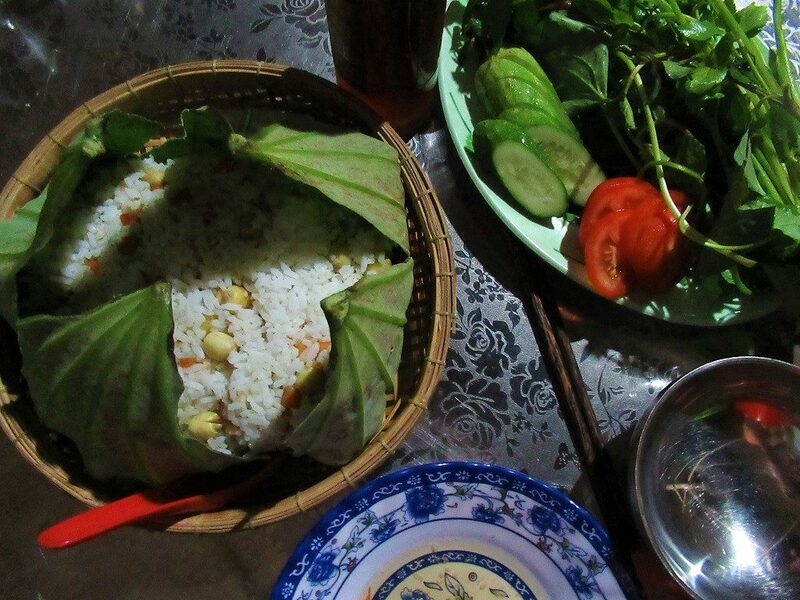 The food is all local: indeed, much of it is sourced from the homestay itself. Unsurprisingly, there’s a lot of lotus dishes on the menu – the lotus plant is famous in Vietnam for every part being edible: the stem, root, seed, flower; even the leaves are used to steam rice inside. In Vietnamese, lotus is sen, so make sure you order something with sen in it. Vegetables, including the ubiquitous and much-loved rau muống (morning glory), are very good, and so are the ‘Mekong meats’, such as rice fields rat (chuột đồng), snake (rắn), eel (lươn), frog (ếch), and snakehead fish (cá lóc). I know some of this might some too ‘weird’, but trust me, it’s all delicious, especially the rat and the eel and the fish. If you’re not feeling adventurous, there’s plenty of free-range chicken (gà) dishes to choose from too. Alcohol options include the usual insipid Vietnamese beers, but much more interesting are the liquors (rượu). Try the rượu sen (29% proof lotus liquor), which is dry and slightly bitter. Depending on how many guests there are, your host may dine (and drink) with you. 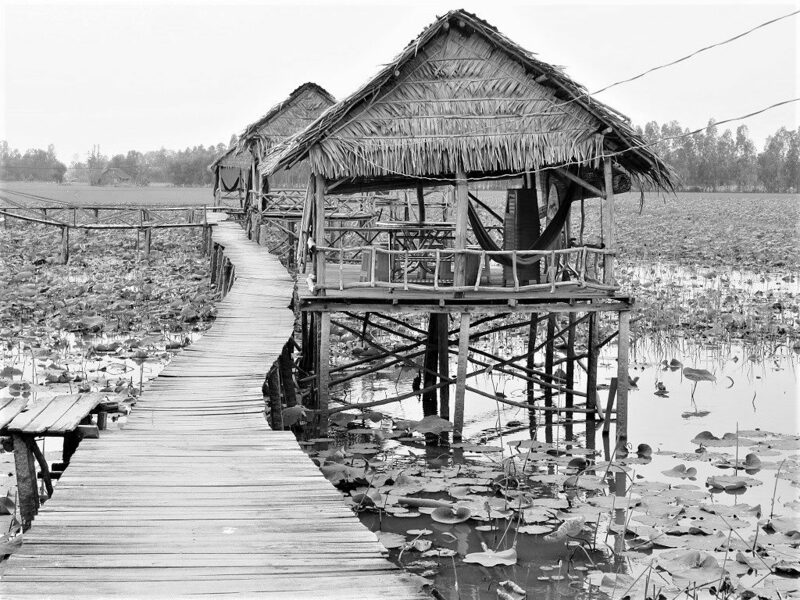 Most of the homestays are arranged in similar fashion: the host’s living quarters, dining area, and communal bathrooms are at the front, on a dyke between the canal and the flooded lotus fields, then a network of wooden platforms and walkways extend out over the lotus lake for about 50 metres, with a dozen or so thatched huts every few metres. The bathrooms are kept very clean but do not feature familiar Western-style conveniences, such as flush toilets and showers. Instead, a large amphora is filled with water, and a plastic scoop-bucket used to self-flush toilets and to shower. There’s running water from the taps in the sinks outside for brushing your teeth or washing your hands. The most atmospheric times of day at the lotus lake homestays are dusk, night, and early morning. At dusk, as the temperatures cool, the homestay families work the lotus fields: checking the plants, catching fish and frogs (which live in the flooded fields), making repairs to the wooden plankways, and preparing dinner. At night, the chorus of cicadas and frogs is hypnotic and romantic: this is a good time to sit out on the walkways staring out over the dark fields. However, mosquitoes are a constant irritation, so make sure you cover up and bring good repellent. Also, remember to bring a flashlight, because there are many potentially dangerous wires and obstacles on the wooden walkways. The mornings start early, with motorized canoes on the canal, cockerels calling, and dogs barking. The lotus flowers are in full bloom during the first few hours of the day; they close from midday onwards. Close to the homestays is the historical site of Gò Tháp/Tháp Mười. Recently excavated and restored, this is the site of several ancient towers, which were places of worship during the time of the Funan Kingdom. The towers, which are now little more than brick foundations, were active places of Hindu and Buddhist worship between the 4th-12th centuries CE. While there isn’t much to see here, there is a certain ‘sense of history’, and the area is also a nice, green, shady place to walk around. 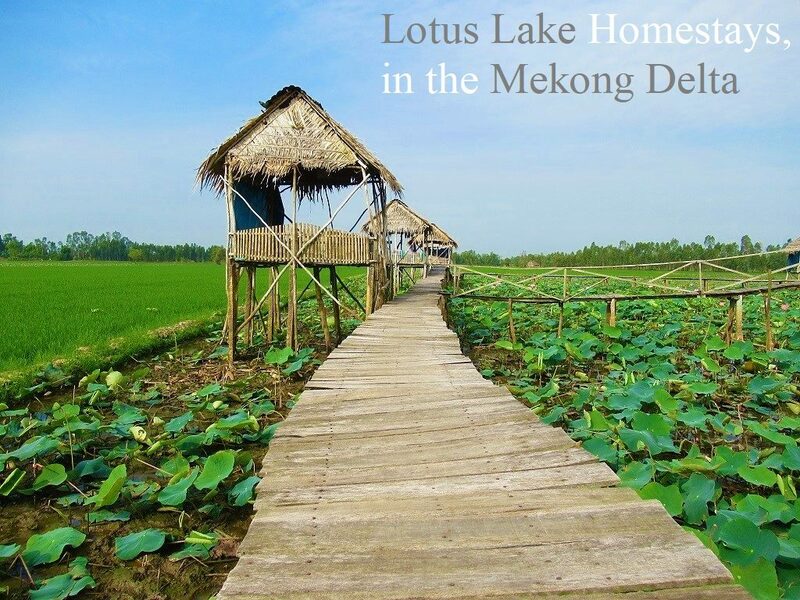 [To check current rates, availability & make a reservation for Lotus Lake Homestay please BOOK HERE]. This entry was posted in ALL, DESTINATIONS, Home Stays, HOTEL REVIEWS, Mekong Delta, Mekong Delta Hotels, Near Saigon, The South and tagged accommodation, budget, Dong Sen, Dong Thap, Hai Lua, homestay, lotus lake, Mekong Delta, review, Vietnam. Bookmark the permalink. Oh dear. It could be that they’ve taken it off Agoda for certain months. Or that Agoda haven’t updated it yet. Anyway, try this number (092 716 2502), or as long as you’re not travelling on a weekend or public holiday you should be OK just showing up. Wel that’s the thing haha. I’m going this coming holiday 30/4, maybe Sunday night already or on Monday. will try to call again. Thanks anyway. Will you go somewhere ? Ah, well, it’s quite likely it will be very busy and that’s why they’ve taken it off Agoda. Unfortunately, public holidays aren’t the most relaxing times to travel in Vietnam. I can’t stop reading your blog.. I am planning my time in Vietnam for the next 2 weeks. I am already in love with this Lotus Lake but motorbike or car is not an option for me as my driving licence is not valid for Vietnam. Can you recommend other way to get there? Preferably, to rent a bicycle from closest town that can be reached from Saigon. Thanks for sharing your view on Vietnam, I found a lot of useful information. Vinh Long, Cao Lanh and Cai Lay are the nearest big towns with any kind of tourist infrastructure. But it’s still quite a long ride from there, even if you can find a place that rents bicycles. You can hire a car and driver for a day or two, but this would cost around $100. Another option, if you’re looking for a less touristy experience of the Mekong Delta, is to contact Susan Tours. She’s based in Can Tho and runs unique local tours in the Delta region. I know her and her tours are far better than the usual Mekong ones. You can contact her through her Facebook page. You can say Tom from Vietnam Coracle sent you. Seems it is not so easy to get there if you are not on your own wheels, I will contact Susan for advise. LOVE your site – I’m afraid I’m about to read ALL OF IT! Visiting Vietnam for the first time 02-12 January so planning already. Four days in Saigon and the rest was open for research. Kinda wanted to visit Con Dao but after reading your posts “kinda” turned into a “must”. Same goes for those Lotus Lake homestays. Now I’m trying to figure out how to combine it in the best way if I’m thinking of flying to Con Dao from Can Tho. We’re thinking of getting some sort of a tour from Saigon to include making it down to Dong Thap, doing the Mekong boat tour – ideally staying at one of those homestays you recommend here – and then being dropped off to Can Tho to catch a flight to Con Dao. A lot of intro for a simple question – is there a reliable tour operator or an agency or an individual that you could recommend for this endeavor? Also, do you think it is too ambitious of a plan if we left Saigon say early morning on the 5th, drove down, did a day Mekong boat tour, overnight, off to Can Tho on the 6th? You could try contacting Buffalo Tours – they’re good and they should be able to tailor an itinerary for you based on what you want to do. That’s just about enough time, but one more day would more comfortable. Just a quick question. Are these homestays geographically close to the floating forest of Long An? On the map, it says they are about an hour apart. Would love to do both in one trip. Is it possible to have this be a 2-day/1-night trip, including the homestay and the floating forests? Anything else you would recommend to make it the most rewarding trip in the South? We like to stay away from crowds, and would be visiting the Mekong during weekdays. 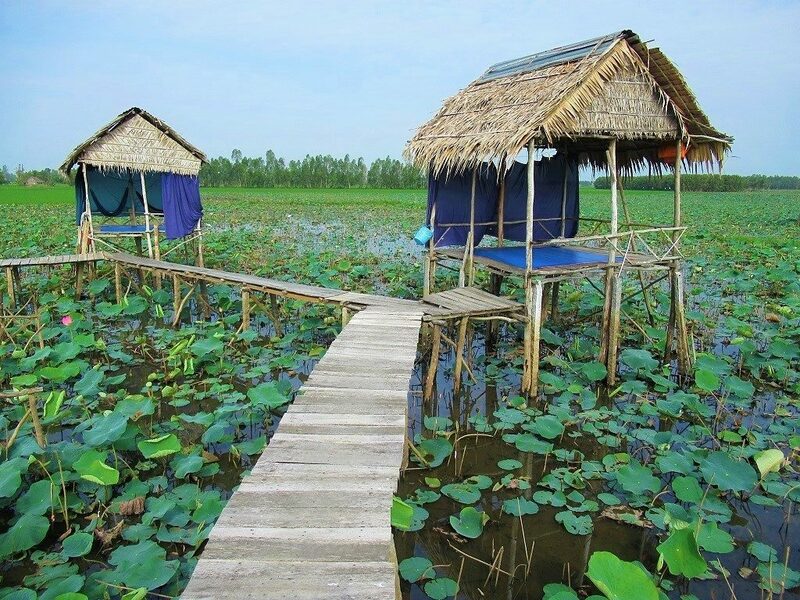 Yes, the floating forest and floating homestay are about an hour away from each other, and both can be visited as part of a 2 day 1 night excursion from Saigon. You could also continue to Tram Chim National Park which is about another hour west from the homestays, and take a boat tour here, but you would need an extra day and night to do that. In general, the most interesting part of the Mekong Delta is the southwest, particularly around Ha Tien, which you can read more about here. Hi Tom. You mention that weekends get pretty crowded and possibly pretty loud. Does that include Thursday and Friday nights as well? I was there on a Thursday night and it was fine. Friday might be busy though. Can you tell me how to get there from Ho Chi? And do you have anymore Must Do’s? Well, this whole website is all about my personal recommendations of things to see and do in Vietnam, so browse the archives and see if there’s anything that particularly interests you. As for getting to these homestays, it’s best visited by motorbike from Saigon. But you could also hire a car and driver or take a tour from Saigon too. Wow, I wouldn’t have even known to look for a place like this, but I’m so interested! 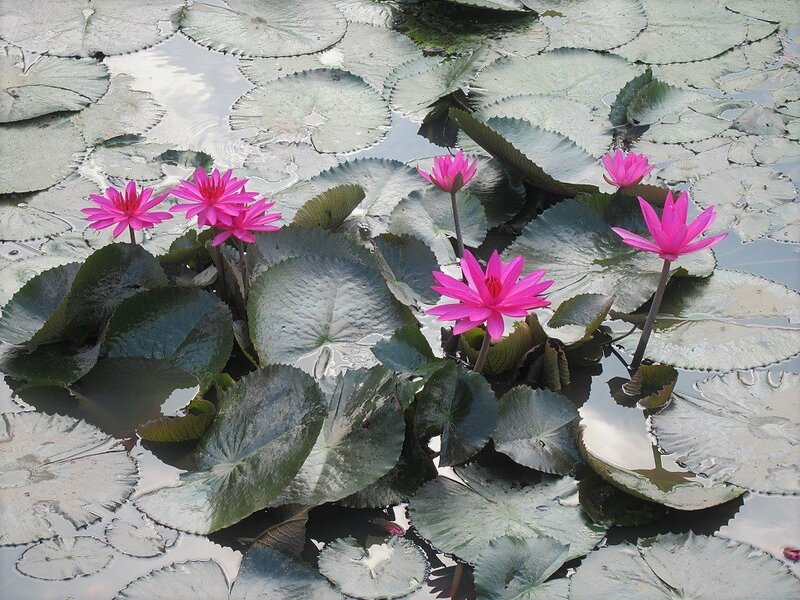 Do you happen to know if the lotuses bloom in Mid-March? I read that the season is much later. I’m not sure about mid-March, but there have always been at least some lotuses in bloom whenever I’ve been there – usually in the mornings the flowers open, then they close again around mid-morning.